At last I am back on my blog after a long break:-)First of all. Sorry for the long silence. Iam quite busy in front of my personal work and kept me very busy and was not able to sit in front of the system .In between I was not well suffer from severe menopause & high BP. . So it extended my break. It feels great to be back, blogging about what I love most – I Have missed a lot of interesting recipes and events .Will visits all your blogs soon. 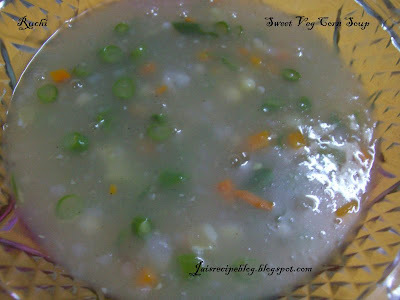 This Vegetable Sweet Corn Soup is a very simple soup, suitable for all occasion. This soup can be turned out easily into a huge quantity. This soup was from one of my favorite. 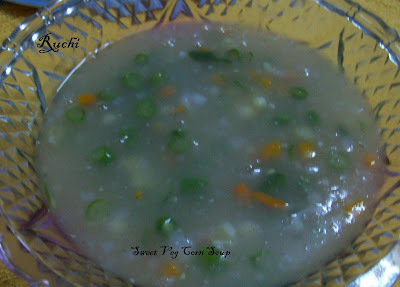 Sweet Corn Soup is Made with tender corn kernels, and flavored with green chili and soy sauce, Plain sweet corn soup is somewhat watery by nature...adding the veggies enhanced the substance and taste. 1. Heat butter in a deep sauce pot. Add ginger garlic paste and sauté for few seconds then drop the finely diced onions to it and cook for 2 minutes. 2.Cut all the vegetables into fine pieces. 3.Cook the corn in the pressure cooker for 1 whistle. 4.In the meanwhile grind the fresh corn kernels into a fine paste and add it to the sauce pot. 5. Now add the vegetables and sauté it for few seconds till the vegetables are soft. 6.Add water, salt, pepper, and bring it up to a boil. 7.Blend cornflour in a little vegetable stock or water and set aside. Add sugar and salt to the soup and continue to cook. 8.When it is cooked add 2 cups of water Add the blended cornflour and cook till the soup thickens. Add white pepper powder and mix. 9.Garnish with spring onion greens and serve piping hot. While mixing the corn flour mixture keep stirring the soup to avoid lumps. In the soup add little chlli sauce and soya sauce and be added while serving. Glad to see you back Akka...Take care of ur health..BTW Hearty and filling soup..
nice to see you back; hope you get well soon! I love this soup,never attempted making this at home! Great soup for this winter, feel like having it right now!!! Mythreyi , Aruna welcome here! hi jaishree, that's a lovely corn soup, I made almost the same way but it is still in my draft!! !, you have a lovely blog here.